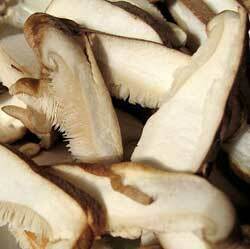 Tip ~ Large flat mushrooms have more flavour than the smaller button mushrooms. Choose firm, undamaged dry ones and store in a paper bag in the refrigerator. Heat the butter and oil in a large frying pan over a medium heat. Add the mushrooms and garlic. Cook for 5 minutes, or until the mushrooms have softened and the mushroom liquid has evaporated. Stir in the spring onions, and then allow to cool. Process the mushrooms with the lemon juice, ricotta, cream cheese and coriander until smooth.